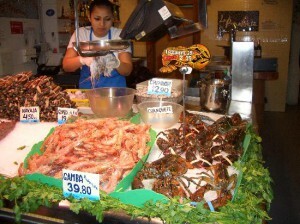 In fact you enter in a fish market … Choose your own seafood, shellfish, schrimps, oysters, octopus, lobster you want to eat. Then the way you want it to get cooked . grilled or fried ? Do you want a fresh salad with home made sauce ( ask for it !) ? Some fresh bread… You order a bottle of wine, some drinks, get plates and cutllers and pay your dinner. Very reasonable price for such fresh seafood ! You get a ticket with a number. Choose a table and wait untill you hear your number … A guy will yeld in Spanish the number you have got “Mesa 25….” or any number when your plate is ready. Go and get it. The setting is very basic but it is part of the fun. You will not see many tourists but many spanish people.